With RSS newsfeeds pushing headlines from newspaper sites to readers, there are now several ways to simulate the feel of reading a real newspaper using these feeds. 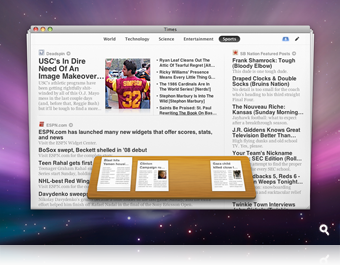 For the Macintosh a new RSS reader called “Times” provides a very slick interface which cleanly creates a familiar newspaper layout for your RSS feeds. Feedjournal, released in February 2008, is a web based approach to creating a personal newspaper. The key feature of Feedjournal is that the resulting layout of your RSS newsfeeds is intended to be printed out to create a personal newspaper. The output is a unique PDF which can be carried on a suitable mobile device like a smart phone or laptop, or simply printed out. An example of the layout produced can be seen in this PDF.